After reviewing several realtor profiles, I selected Rachel Frentsos to be my Real Estate Agent to assist me in finding a condo. I found her to be very professional, very knowledgeable and very responsive. She really listened carefully to my requirements and wishes, provided invaluable insight into the market I was interested in, and scheduled time to visit properties within a few days. Because she so thoroughly understood what I wanted, we traveled 1 day, looked at five properties and I found the perfect condo for me on the same day! Rachel also recommended the best resources for obtaining my mortgage, home inspection and renovation contractors which made the entire purchase process enormously smooth and hassle free. I moved into my new home 6 weeks after the day I met Rachel! Doesn’t get any better than that…! !Sharon B.
Sharon reached out to me to find a home to purchase in the Annapolis area. She knew exactly what she wanted, and it made the search very easy. She was renting a place in Annapolis and was looking for a condo with a garage that didn’t need any updating. We saw a variety of places but realized quickly that her budget might mean purchasing a house outside of the immediate Annapolis area. 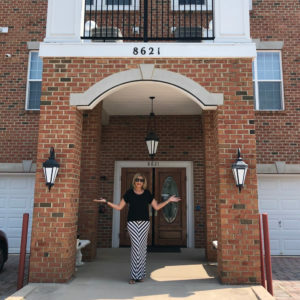 The expanded search paid off nicely and Sharon fell in love with a great condo just a handful of miles away from Annapolis in a 55+ community that had everything she wanted. I even negotiated a few pieces of furniture that Sharon loved into the purchase. Sharon stuck to her budget and knew what she wanted and was willing to adjust her preferred location to find the perfect place for her. In the end, she found a home that was close to highways, restaurants and shops. I’m happy we found each other and that she found her perfect new home.